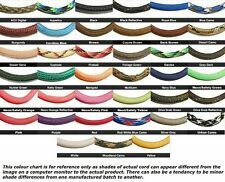 Paracord 550 100' 100 Foot CHOOSE OVER 300 COLOURS! GENUINE 7 STRAND PARACORD! Is what you need when entering areas of maximum infestation. It's small portable size is easy to carry and perfect for your purse, bag, or suitcase. 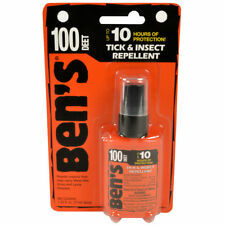 Active ingredient: 100% DEET. All DEET, no filler - for areas of maximum infestation. This adapter gives your 12 Gauge single or double shot break open shotgun the ability to fire a 9MM bullet (standard 9mm Luger - 9x19). This adapter is precision machined from high quality stainless steel to the OD specifications of a 2 3/4 12GA shell. De haute qualité, peut être utilisé pour des milliers de fois. 100% tout neuf et de haute qualité! Salt & Pepper Shaker Set By Coghlan's. Spill Proof. 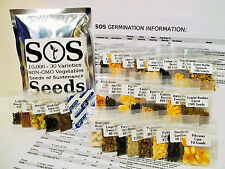 Great for traveling, camping hiking picnics and BBQ. But it'll keep your spices dry and handy. If we find the item is defective, we will attempt to repair or replace the item. One 12mm x 125mm Ferrocerium rod with 4mm drilled hole. Ferrocerium is a modern alternative to old school flint and steel. The pyrophoric effect is dependent on the brittleness of the alloy and its low autoignition temperature. It is a must for everyone. I have several other military things listed as well. Be sure to check it out. I may have it but not listed it yet. This adapter gives your 12 Gauge single or double shot break open shotgun the ability to fire a 22lr bullet. This adapter is precision machined from high quality stainless steel to the OD specifications of a 2 3/4 12GA shell. One 15mm x 150mm Ferrocerium rod with 6mm drilled holes. Ferrocerium is a modern alternative to old school flint and steel. The pyrophoric effect is dependent on the brittleness of the alloy and its low autoignition temperature. Open frame style, open coil form, built-in mounting board, push pull type DC electronmagnet.Used widely in banking ATM, vending machines, electronic appliances, embroidery machines, intelligent lock, juice bread maker, textile machines, cash register or other automatic control devices. Model : ZYE1-0530Material : Metal, Electronic Parts Rated Voltage : DC 12VType : Push Pull TypeRated Current : 1A Stroke : 10mm;Body Size : 30 x 15x 14mm / 1.2""x 0.59""x 0.55""(L*W*T)Plunger Bar Size : 6 x 57mm / 0.24""x 2.2""(D * L) Cable Length : 20cm / 7.9 Weight : 32g Brand Unbranded MPN Does not apply UPC 4894462378441 EAN 4894462378441 ISBN 4894462378441 Designer/Brand Unbranded UPC 4894462378441 EAN 4894462378441 ISBN 4894462378441. Fox 40's first pealess whistle. The harder you blow, the louder the sound! Reliable, flawless consistent and penetrating sound. Used by referees and coaches at all levels who need every call to be heard and depend on its reliability. Flawless, consistent and penetrating sound keeps the referee in control of the game. Be heard above ambient noise, the roar of engines, breaking waves and gale-force winds. The chambers are designed to self-clear when submerged in water. No moving parts to freeze, jam or deteriorate. • Military specifications III 255kg / 550lb Paracord is made from 100% Nylon, includes the 7 inner nylon, strands with a nylon outer sheath. 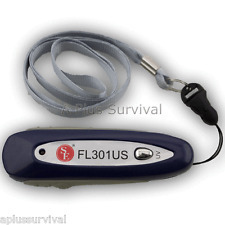 Perfect for magnet fishing, camping and outdoor adventures. Longueur : 15 mètres.7 fils à l’intérieur de la corde pour une solidité optimale. Couleur: Vert camouflage. Diamètre : 4 mm. New from the makers of the popular Fat Rope Stick, The Fire Strip Roll is made out of thick and fibrous paper. It is fully infused with wax and oxygen free. The paper simply unrolls from the inside. 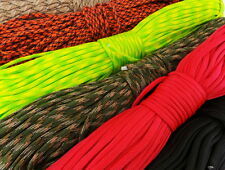 Fat Rope Stick is handmade to achieve superb performance in all weather conditions. The compact design, along with the relatively soft texture, makes Fat Rope Stick easy to cut with your favourite knife and simple to process for burning. 100% new and high quality. Outdoor camping 550 parachute cord survival bracelet U-shaped buckle. Hard, will not rust, small size, high strength. Light earthquake surface treatment, smooth and bright. BRIQUET DE SURVIE. Fonctionne avec de l'essence à briquet (non fournie). A nice gift for outdoor adventurers, military personnel, campers, hikers, hunters teen boy scouts or even constant travelers. ► VARIOUS MULTI-PURPOSE PARTS - The rescue blankets 90% of the body's heat can be used for the protection of the floor, sun protection, sickness, beacon transport, as a raincoat and to cover. 1 x Brass Threading Needle for Paracord or Threading Laces. 1 x paracord / threading needle - quality brass - will not rust! Internal threads to secure paracord or any other grip material. Use for paracord, thread, cord, leather. anything gripped! Paracord 2x4mm, 5m, dunkelblau. Paracord 2x4mm, 5m, schwarz. Paracord 2x4mm 3x3m gelb/gr. Paracord 2x4mm, 5m, rosa. Sie beschäftigt 16 Mitarbeiter. Gründer und Inhaber der Firma sind Gudrun und Reinhard Löffler. Kevlar Sewing Thread, 1 x 40m bobbin reel, Tex-80. The images below are for illustrative purposes only and are not included in this sale. The kevlar thread is not shiny (the reel is wrapped in a clear plastic protective cover). Paracord 2x4mm, 5m, dunkelblau. paracord 2x4mm 3x3m weiß/bl. Paracord 2x4mm, 5m, rosa. Sie beschäftigt 16 Mitarbeiter. Gründer und Inhaber der Firma sind Gudrun und Reinhard Löffler. Wir produzieren von Beginn an nach dem Motto „so natürlich wie möglich“ unter dem Aspekt der höchst möglichen Qualität. Paracord 2x4mm, 5m, dunkelblau. Paracord 2x4mm, 5m, schwarz. Paracord 2x4mm, 5m, rosa. Paracord 2x4mm 3x3m gelb/gr. Sie beschäftigt 16 Mitarbeiter. Gründer und Inhaber der Firma sind Gudrun und Reinhard Löffler. Kevlar Sewing Thread, 1 x 50m bobbin reel, Tex-40. The images below are for illustrative purposes only and are not included in this sale. The kevlar thread is not shiny (the reel is wrapped in a clear plastic protective cover).